the happygirl: entertainme: review: "I don't know how she does it"
entertainme: review: "I don't know how she does it"
It isn’t just the age old topic of how a mom juggles work / family / home that is the draw but also the affable Sarah Jessica Parker in “I Don’t Know How She Does It.” We loved SJP when we were single devil-may-care girls but now we’ve grown together into new lives where baby bottles have replaced Cosmopolitans and our chosen footware is something-anything- that will protect our tender feet from stepping on a Lego in the middle of the night. And Sarah Jessica Parker continues to be our guide on this new adventure towards grown-uphood. 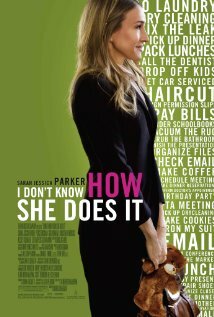 Based on Allison Pearson’s best-selling British novel of the same name “I Don’t Know How She Does It” is the story of Kate Reddy (Sarah Jessica Parker) married with kids and a high powered job that often takes her away from home. There are lists to be made (which cleverly are written on her ceiling as she lies awake at night), flights to be caught and pies to be made. Sort of. We see Kate frustrated as she tries to juggle motherhood, work and marriage. Yes, these topics have been explored to the n’th degree by Hollywood but there is a freshness here mainly because of a well assembled cast with Greg Kinnear (less smarmy than usual) as her husband, Kelsey Grammer as Kate’s boss, Olivia Munn (who absolutely deliciously steals every scene) as her assistant and Busy Phillips as the quintessential NYC mom. The film also stars Pierce Brosnan as Kate's business partner, Seth Meyers (“Saturday Night Live”) as her work rival and Christina Hendricks (“Mad Men”) as her single mom pal. “I love Sarah Jessica Parker. She’d be a fun friend, don’t you think? She feels like an old friend. I liked this better than the book. Do you know if there is a soundtrack? My sister would love this movie. Busy Phillips looked AMAZING, right? Do you want to go grab a drink? I still have 40 minutes before I have to go home. I can’t. I promised hubby tonight was his lucky night so I gotta go. Next week maybe?” See, choices. Yes, you have seen this story before but if you are a busy mom you will enjoy this night out with an old friend. There may not be Big or witty banter but there will be laughter.